Ticino, the italian speaking canton of Switzerland, where deep granite canyons and smooth bedrock drops create one of the world’s finest destinations for steep creeking. Gene17kayaking offers great pool drop white water & an unique swiss experience. The Swiss canton of Ticino is famed for narrow canyons, bedrock rapids, and breathtaking scenery. Undoubtedly one of the most beautiful regions of the alps, Ticino blends swiss and italian culture to create it’s own flavour – a true connoisseur’s alpine paddling experience. The crowning glory of the Ticino region is the incomparable Verzasca, famed for clear water, Incredible rock formations, and clean pool-drop rapids. beyond the Verzasca we’ll explore a selection of steep and narrow gems dotted along the shores of Lake Maggiore’s beautiful alpine riviera. Whether we visit the Ribo, Rovanna, Cannobino, or San Giovanni, you’ll experience some true alpine classics, with time for the very best coffee, wine and ice cream in between. 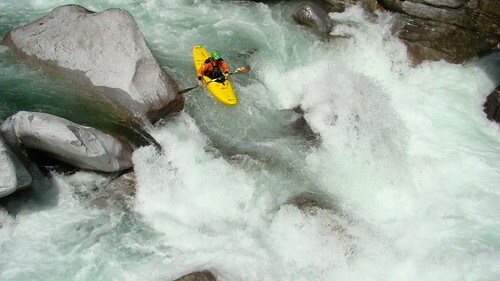 Ticino Steep Creeking Adventure takes place on Class IV/IV+ whitewater. The Ticino Steep Creeking Adventure is suitable for experienced paddlers who are able to paddle for 4 – 6 hours in a day on Class IV Generally the rivers are accessible with near road access, but occasionally there may be some exposed terrain. This trip begins on an easier section of whitewater, but will soon reflect conditions expected at the grade. Participants should therefore expect to be in a river environment during peak runoff for sometimes extended periods of time. You MUST be able to roll in Class IV white water on demand for most occasions. You’ll be staying at shared apartments and B&B’s along the way with all bed linen provided. We’ll provide a continental breakfast. We’ll head to great local restaurants, plus provide the cooking equipment if as a group we wish to cook, as we road trip from Piemonte to Ticino.